East River C.R.E.W. is making waves, and we’re mighty proud. Check out our newest happenings, media coverage, blog mentions and social media opportunities. 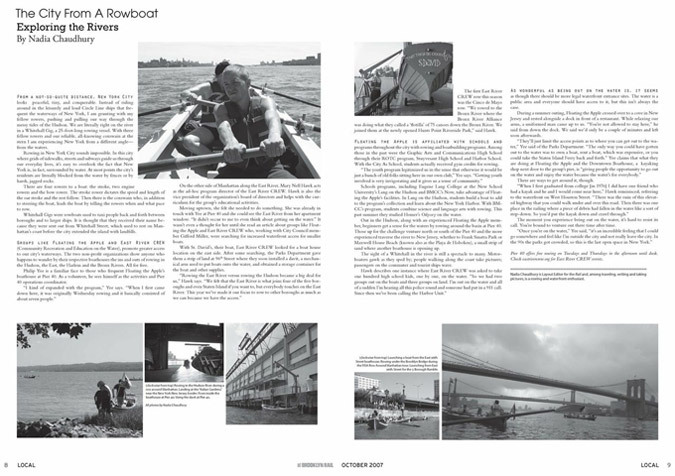 We’ve also included pieces that indirectly refer to rowing on the East River. PLEASE NOTE THAT THE FOLLOWING IS NOT A COMPLETE LIST OF COVERAGE. The East River C.R.E.W. (Community Recreation and Education on the Water) is also advocating for a facelift for the esplanade. The group offers free open-water rowing sessions every Tuesday at 5 p.m. that launch from the East 96th Street esplanade entrance. According to C.R.E.W. member Mary Nell Hawk, its goal is to raise the profile of the East River through rowing and estuary education. Nell said that in the future, the group would like to see safer, more clearly marked pedestrian crosswalks, shade arbors installed near their boat launch site and educational signage dispersed throughout the esplanade.